For some reason, this year was the first time I noticed the pink magnolias (Magnolia × soulangeana) in the bay area. I was dumbfounded, how could I have not noticed such amazing trees before? It seemed almost everywhere I looked I was running into them. For spring break we did our usual trip down to my in-law’s house in Southern California. 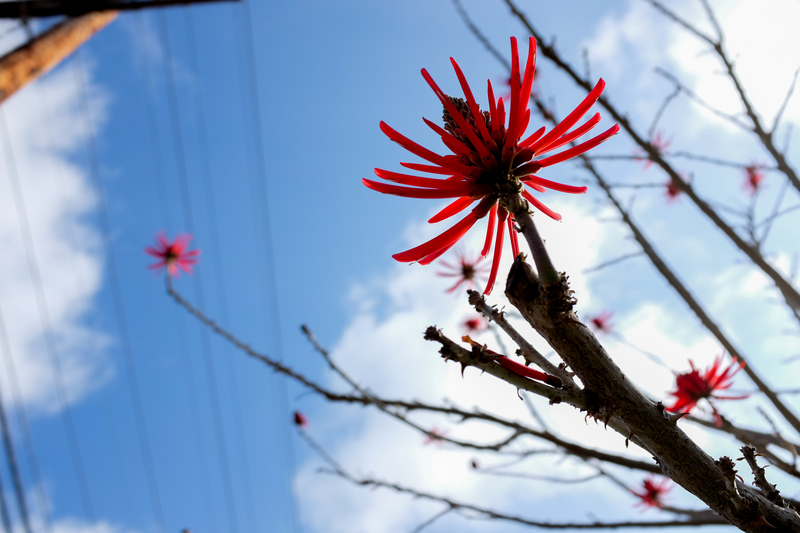 The photo above is of a Coral Tree in their neighborhood that I always love to see in bloom at this time of the year. I’ve noticed this tree every time I go down there in spring. At times, Southern California tempts me not only with her beaches, but with the varieties of trees(and fruits) that can grow down there(I would love to have a fruiting Cherimoya tree someday). It was an interesting week for me. Besides the flowering trees, I noticed a lot of stress in myself around the unsettled nature of my future employment and possibly a resultant depression. As has become custom for trips down here, I was waking up early to go surfing in the mornings. I managed to go every morning except for one. I finally realized I was depressed since surfing wasn’t bringing me the energy that normally keeps me content and in a good mood for the rest of the day. I noticed that I was more restless than usual and my wife and I had several stressful days when the topic of my difficulties in finding a job came up. Despite not getting the usual boost, all that surfing gave me a lot of time to ponder life and the “bigger picture”. Besides being out in the water and the thrill of catching a wave, what I really appreciate about surfing is that it gives me the opportunity to slow down and think a bit. I’m realizing that for the past few months at home I really haven’t a chance to slow down at all. At work I’ve actually been pretty busy(not usually the case), but I have been stressing about the upcoming end of my current position, while also trying to sort out my research data for an upcoming presentation. At home things are always hectic and I haven’t had many chances to just be still. All in all, surfing that week gave me the chance to really slow down and take stock of things. I was greeted almost every day with dolphins and each day I found a new way to see the experience of surfing as giving me a message on life. Interpreting it has not always easy though. On the first day out I was reminded that waves look a lot bigger or “scarier” when you are lying on your stomach. I’ve been out of the water for a few months due to weather conditions and scheduling, so I was happy to have small waves the first couple of days. I noticed(or was reminded) that when I was paddling out or just resting in a prone position on the surfboard that the waves looked a lot bigger than they really were. This meant that I might paddle for a wave that had no chance of breaking, or that I would get a moment of panic when an incoming wave seemed too big. I would sit up to turn the board around and realize that the wave was actually quite small and nothing to worry about or expend energy on. Another day I went out it was quite foggy. I could only see a bit of shore and a small distance out towards sea. My focus was on a small circle around me that I could make out. At one point the fog lifted a bit and I could see the pier and other surfers up and down the beach. I had known where I was more or less all along but it was startling to be socked in by fog for so long then suddenly get a much larger view of where I was in relation to everything else. I felt more connected to the beach and world at large. Another morning I went out again a bit earlier than usual and found the waves were bigger than the previous days and looked like it would be a bit of a challenge. I got out past the breakers and did well initially. Then for the rest of my session I kind of just drifted. I went after some waves with no success. I drifted closer to the pier where the waves seemed to be breaking with a better shape but it was more crowded and I never seemed to be in the right position to go for the wave. In the end, after my first couple of waves I spent the next hour or so not doing much other than floating and paddling for waves while in the wrong spot; I went home frustrated. The insights from my surfing experiences are various. First of all, I found the experience of seeing waves as bigger than they really were speaks of my tendency to see problems or hurdles to overcome as much bigger than they really are upon first “seeing” them. Usually, any sort of obstacle immediately seems impossible and I tend to give up in despair. Perhaps I’m going through life in a passive and prone position and from that vantage point everything seems daunting. Maybe it would help to sit up and get a better view of what is really around me and what I am capable of. Similarly with the fog, I tend to focus on what is immediately around me and have a hard time getting the wider view of what is going on. I’ve found that in science, unless I have a good sense of the “big picture” I feel like my drive and purpose get hazy. The experience that impacted me the most was the feeling that after a decent start, I kind of slack off. A lot of surfing is about going with the flow, but at the same time, especially at beach breaks where the waves don’t always break in the same spot, one must put effort into observing where waves tend to be breaking. Then, if you are going to move over to the “good spots”, one must be confident enough to jostle for position with the other surfers that will inevitably be there. I think I tend to seek out the less consistent waves because they are usually less crowded. Sometimes that is fine and I don’t mind the lower wave count and quality, I can be happy with the opportunity to be out in the water. That day however I was frustrated that I didn’t hunt down more waves. Perhaps it was because I was colder than usual(My old wetsuit isn’t in the greatest shape)or because I hadn’t been surfing for several months before the trip, but I wanted the short window I had to be more fulfilling. The realization I had was that I would have to work harder at not only making an effort and moving if I needed to, but also to be more observant and critical. In life, I think this early success followed by passivity has come up again and again. More recently this has manifested itself in my current work position. When I came on about 10 years ago I had a highly productive period building models for research. After that I kind of coasted on that and let things come to me rather than actively search out new projects and opportunities to learn. As I trying to determine my next career move I see that tendency trying to take over all the time. I have a possible offer for employment, and while I appreciate it another part of me knows that I would be better off all around if I had several options to choose from. Even if this position works out and I choose it, I think I would feel better about it I knew that I had worked at setting up various options to choose between. After that frustrating surf day I made a conscious effort to constantly reassess where I was and where the waves were breaking. I moved if I needed to and tried not to let the presence of other surfers deter me from the good peaks. It helped a lot. I felt more confident and had a better time. I even caught myself almost giving up an opportunity to surf on my last full day there(I was upset since my daughter had woken up with a fever after coming down with a cold the previous day). I realized what I was passing up and took my wife up on her offer, and had a really good time. I’ve tried to carry that experience into other aspects of my life as well this past week. I hope to keep at it. A week out from vacation, and back at home, I am left with many things to think about. First of all, even if surfing wasn’t giving me the usual lift and energy, it still gave me time to still my mind, and from that I was able to slow down and make connections between surfing and my life. It reminds me that surfing has immense meaning to me, and I should devote more energy to making it happen more often at home. I should also sit up and better see the “waves” and beautiful flowers that life is placing all around me.